the purpose of our “walk”. I came across your booties via the website and ordered them. they are as good as new. Those little things are like Kryptonite. I am impressed. walks so the PAWZ saved my life!! I told everyone at agility class about them. my husband trimmed one our dogs Maggie’s nails too short and it was bleeding. to keep her cut clean. We did this for a few days until the cut healed. great product. I saw them at the Chicago trade Show but did not buy any. 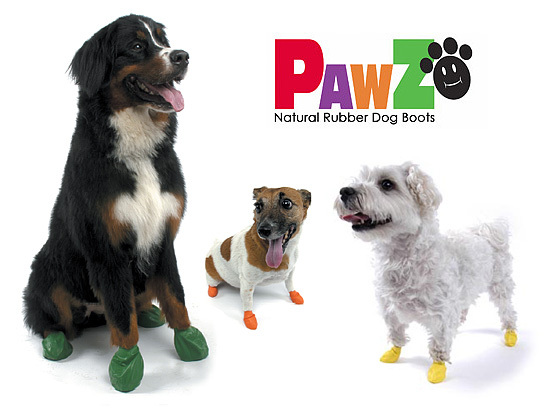 “We are still loving our PAWZ dog boots for our dog Benny. I am amazed how the boots stay on….Benny just loves them and goes romping in the snow….another woman that we met in town said her dog wears them also and seems to get “energized” when he puts them on…. “The PAWZ are awesome. I have already directed a few dog park people to your web-site. Hazel was the hit of the park the other night in her beautiful purple PAWZ. “These boots are great; I’m telling everyone about them. gauze bandage clean and dry and the dogs find them comfortable. “You guys are the bomb!!! Yesterday, my little Yorkie, Sadie Louise was biting at her paws….she has allergies and chews on her paws regularly, only this time, she made one of them raw and a little bloody. I cleaned up her paw. I went to Cause for Paws pet store and asked if they had socks for dogs…when the owner asked WHY … she showed me PAWZ. I think these things are brilliant. Ms. Sadie cannot get the PAWZ off. I called my VET and told her all about the product. She said, “I will bet whoever invented these will make millions…” I hope you do. I have plans to share them with every “dog’ person we know…and we know lots of “dog” people….most of whom are as nuts about their dog as we are.